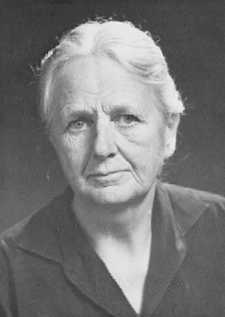 There's something refreshing about Joan Robinson's take-no-prisoners critiques of economic theory. In the 4th volume of her Collected Economic Papers, there's an essay entitled "The second crisis of economic theory". There is the problem of the relative levels of different types of earned income. Here we have the famous marginal productivity theory... The real wage of each type of labour is supposed to measure its marginal product to society. The salary of a professor of economics measures his contribution to society and the wage of a garbage collector measures his contribution. Of course this is a very comforting doctrine for professors of economics but I fear that once more the argument is circular. There is not any measure of marginal products except the wages themselves. In short, we have not got a theory of distribution. We have nothing to say on the subject which above all others occupies the minds of the people whom economics is supposed to enlighten. "Memoirs of an Economics Student" (a blog I've linked to on this page) reports the latest in a student-led "anti-Mankiw" effort, this one in the form of a blog. Of course, it's nothing personal. Mankiw's principles text just happens to be a prominent feature of an orthodoxy that predictably evades any real critical examination of the status quo. As the status quo becomes more and more unacceptable to more and more people, its unsatisfactory nature becomes ever more apparent. I can hardly disagree, as this "bias" -- as expressed in all of the mainstream textbooks, not just Mankiw's -- was the central theme of our Economics Anti-Textbook, whose primary goal was to help students in such courses defend themselves against it. 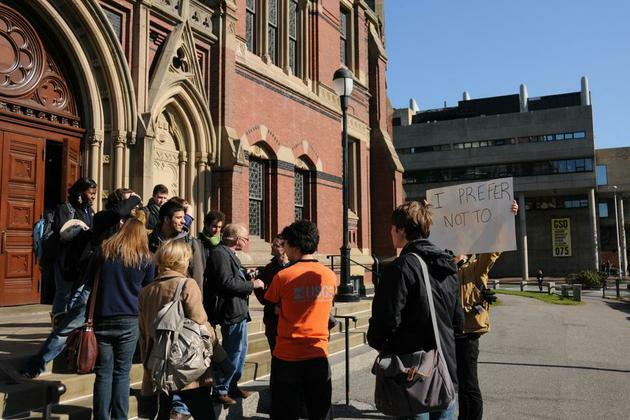 Some students outside Sanders Theatre, Harvard, after leaving Ec 10. From The Harvard Crimson. Care in presenting an unbiased perspective on economics is particularly important for an introductory course of 700 students that nominally provides a sound foundation for further study in economics. Harvard Republican Club Secretary Aditi Ghai ’14, who took the class last year, said she doesn’t think the class is biased. “The class is about pure economic efficiency. Ideology comes into play when we determine how to balance efficiency with social equity,” she said. But a decision to focus the course on "economic efficiency" is a value judgement in itself; it puts some questions to the fore; backgrounds others. Our values determine the questions we ask, as Zinn notes, and the questions we don't ask. In the Anti-Textbook (pp.208-210) we also argue that it doesn't make sense to think of "efficiency" as a primary social objective like equity is, although this student has, not surprisingly, been given the impression that it is. I read the students' open letter to Mankiw as also asking for a broader perspective in the principles course. ("As your class does not include primary sources and rarely features articles from academic journals, we have very little access to alternative approaches to economics.") That's a key thing that's lacking in the typical mainstream text, and thus in the typical mainstream economics course. As the small number of alternative principles texts demonstrates, it doesn't have to be this way. Postscript: The sort of alternative texts I mean are books like Bowles, Edwards and Roosevelt, Understanding capitalism (Oxford University Press), Goodwin, Nelson, Ackerman and Weisskopf, Microeconomics in Context (ME Sharpe) or Sherman, Hunt, Nesiba, O'Hara and Wiens-Tuers, Economics: An Introduction to Traditional and Progressive Views (ME Sharpe).